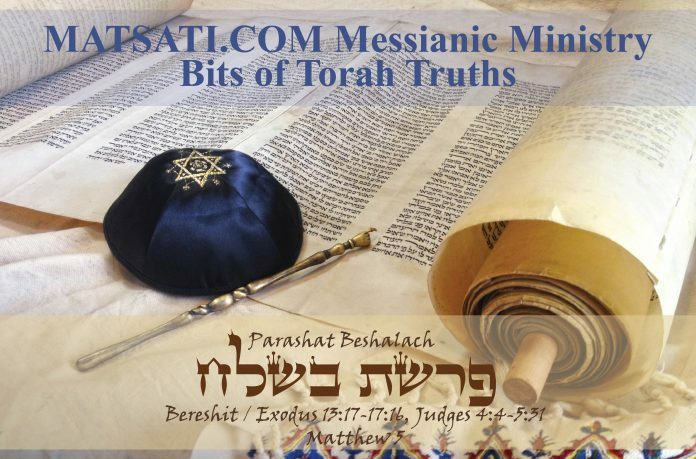 Home Bits of Torah Truth Bits of Torah Truths, Parashat Beshalach, How Serious is Your Faith? In this weeks reading, from Parashat Beshalach (Shemot / Exodus 13:17-17:16), Pharaoh lets the people go, and the Lord led the people by a pillar of cloud during the day and pillar of fire by night. The Lord hardens Pharaoh’s heart (14:4-9) and his army follows the children of Israel to the Red Sea. The Lord divides the sea so the people could cross on dry land (14:15-22). The Egyptian army pursued Israel and the Lord destroys the army (14:23-31). The people sing a song exalting the Name of the Lord (15:1-22). The people travel to Marah and the Lord tested them there (15:23-26). The people travel to Elim where there were twelve springs and seventy date palms (15:27). They then travel to the wilderness of Sin and the people grumbled against Moshe and Aaron because there was no food (16:1-3). The Lord gives the people bread in the morning and meat in the evening to eat (16:5-16). The command to rest on the Sabbath is given with the instructions on how to gather the Manna during the end of the week (16:17-30). The people journeyed slowly to the mountain of Sinai, arriving at Rephidim where there was no water to drink (17:1-3). The people complained again about leaving Egypt (17:4), the Lord commands Moshe to strike the rock to make water for the people (17:5-7). Amalek fights against Israel and the Lord declares that He will blot out the memory of Amalek from under heaven. In this week’s reading the Lord delivers Israel by drowning the entire Egyptian army in the Red Sea and provides bread from heaven. While reading through the first couple verses from the portion, it is interesting to note that Pharaoh let the people go and the Torah describes that the Lord God did not lead the people by the way of the Philistines saying that the people might change their minds and return to Egypt. It is interesting while studying the opening verses to Parashat Beshalach, the Lord says the people would be discouraged by war, and thus He leads them by the way of the Red Sea. In a similar manner, placing our faith in Yeshua the Messiah, the Lord saves and delivers us, the Lord is leading us to walk in His ways which are contrary to the way of the world. The very idea of setting our feet on the path to walk in God’s ways sets us at war, not only with this world, but in the spiritual world as well. According to Parashat Shemot (Exodus 1:1-6:1) Moshe was to bring the people to the mountain (Sinai) to worship before leading them to the Promised Land in Shemot / Exodus 3:11-12. If the Lord had planned to bring the people first to Sinai, why mention that they did not travel by way of the Philistines and of war? Why do you think Moshe wrote this down like he did in the Torah? The rabbis of blessed memory also had these questions and devote a large section of Midrash Rabbah to discussing this topic. Midrash Rabbah Shemot, Parashat 20, Part 11 (מדרש רבה שמות פרשה כ סימן יא) has the following to say concerning the way the Lord led the people after having left Egypt. That God led them not by the way of the land of the Philistines (Shemot / Exodus 13:17). God did not conduct himself with them in the usual manner; for usually when one purchases servants it is on the understanding that they wash and anoint him, help to dress him and draw his carriage and light the way before him. God, however, did not do so, for He did not lead them in the usual way, but He washed them, as it says, Then I washed you with water (Ezekiel 16:9); He anointed them, as it says, And I anointed you with oil; He clothed them, for it says, I clothed you also with richly woven work (Ezekiel 16:10); He bore them, for it says, And how I bore you on eagles wings (Shemot / Exodus 19:4); He illumined the way before the, as it says, And the Lord went before them by day, and by night in a pillar of fire, to give them light (Shemot / Exodus 13:21), for this reason does it say, And God led them not by the way of the land of the Philistines, etc. Why did He not lead them through the land of the Philistines? Because the tribe of Ephraim in error departed from Egypt before the destined time, with the result that three hundred thousand of them were slain. And why were they slain? Because they counted the four hundred years from the day when God spoke with Abraham between the pieces (Bereshit / Genesis 15:13-16), but they erred by thirty years, as it says, The children of Ephraim were as archers handling the bow (Tehillim / Psalms 78:9). Had they not thus miscalculated, they would not have departed; for who wanted to bring forth his children to the slayer? Ephraim, himself; as it says, but Ephraim will bring forth his children to the slayer (Hosea 9:13). It was the Philistines who slew them, as it says, and the sons of Ephraim, shuthela, whom the men of Gath that were born in the land slew (1 Chronicles 7:20). Their bones lay in heaps on the road, for they had gone out of Egypt thirty years before the rest of their brethren. Therefore, the Holy One blessed be He, reasoned, If Israel behold the bones of the sons of Ephraim strewn in the road, they will return to Egypt. It can be compared to a king who took a wife and wished to return to his country. He set her in her bridal litter, but his wife died before he could enter the country. Whereupon, he buried her at the entrance of the country and then married her sister. The king then decided, I will lead her by a circuitous route, lest she behold the grave of her sister and wish to withdraw from the marriage. So what did he do? He led her round about the country. Similarly, God said, Let them go round about so they may not see the bones of their brothers cast on the road and wish to return to Egypt. What did god do? He took the blood of the sons if Ephraim and dipped His garments, as it were, therein, for it says, Wherefore is Your apparel red? (Isaiah 63:2). God said, I will not be comforted, until I avenge Myself of the crime against the sons of Ephraim, for it says, and God was not comforted (naham). יא ולא נחם אלהים דרך ארץ, שלא נהג עמם כדרך כל הארץ היאך דרך כל הארץ מי שהוא קונה עבדים קונה אותם על מנת שיהיו מרחיצין אותו וסכין אותו ומלבישין אותו וטוענין אותו ומאירין לפניו אבל הקב״ה לא עשה כן לישראל אלא לא נחם אלהים כדרך כל הארץ אלא שהיה מרחיצן שנאמר (יחזקאל טז) וארחצך במים, וסך אותן שנאמר ואסוכך בשמן, והלבישן שנאמר ואלבישך רקמה, ונשאן שנאמר (שמות יט) ואשא אתכם על כנפי נשרים ומאיר לפניהם שנאמר וה׳ הולך לפניהם יומם, לכך נאמר ולא נחם אלהים דרך ארץ (וגו׳, ולא נחם אלהים דרך ארץ) פלשתים, למה אלא שטעו שבטו של אפרים ויצאו ממצרים עד שלא שלם הקץ ונהרגו מהם ל׳ רבוא ולמה נהרגו שחשבו מיום שנדבר אברהם בין הבתרים וטעו ל׳ שנה שנאמר (תהלים עח) בני אפרים נושקי רומי קשת לולי שטעו לא יצאו מי היה חפץ להוציא אל הרג בניו, אפרים שנאמר (הושע ט) ואפרים להוציא אל הורג בניו והרגום פלשתים שנאמר (ד״ה דברי הימים א ז) ובני אפרים שותלח והרגום אנשי גת, והיו עצמותיהם שטוחין בדרך חמרים חמרים שכבר היה להם ל׳ שנה שיצאו עד שלא יצאו אחיהם ממצרים, אמר הקב״ה אם יראו ישראל עצמות בני אפרים שטוחין בדרך יחזרו למצרים, למה״ד למלך שנשא אשה וביקש לילך למדינתו הושיבה באפריון ולא הספיק ליכנס למדינה עד שמתה אשתו קברה על פתח המדינה ואח״כ נשא אחותה אמר המלך הריני מסבבה שלא תראה קברה של אחותה ותחזור לה, מה עשה סיבבה מאחורי המדינה, כך אמר הקב״ה יהיו מסבבים את הדרך כדי שלא יראו עצמות אחיהם מושלכין בדרך ויחזרו למצרים, מה עשה הקב״ה נטל דמם של בני אפרים וטבל בו כליו כביכול שנא׳ (ישעיה סג) מדוע אדום ללבושך, אמר הקב״ה איני מתנחם עד שאנקום נקמתן של בני אפרים שנאמר ולא נחם אלהים. The midrash states that the Lord God did not conduct Himself in the usual manner after having purchased servants. Generally speaking, when one acquires a servant, one has his servants take care of him, but the Lord God instead, he washed his servants, annointed them with oil, and gives them rich woven clothing. The Lord bore Israel on eagles wings, and He led them by a pillar of fire at night and cloud during the day. The description given here is the Lord moving and doing something different, the Lord God is conducting Himself in a new way by leading the people Himself in the way they should go. The midrash asks “why did God not lead them through the land of the Philistines?” The reason given by the rabbis was because Ephraim departed from Egypt early and three hundred thousand of them died. Note that Ephraim in the rabbinic literature may be used as a reference to Israel. The idea is that Israel attempted to go their own way prior to the Lord showing them the way. This led to their death. The bodies and bones of the dead remained on the road to the land of the Philistines and so the Lord chose to lead them by another route so they would not see the dead. This allegorical interpretation on the reason behind why the Lord led Israel by way of the Red Sea verses directly to Israel is packed full of meaning with regard to waiting upon the Lord, seeking the way of the Lord verses our own ways. Another midrash states that the reason for leading Israel on another path was for the purpose of training and learning God’s ways according to the commands because it was better to have given them the Torah first and then come into the Promised Land. Another explanation of, That God led them not. It can be compared to a king who had a son to whom he wished to bequeath an inheritance, but he argued, If I give it to him now that he is small, he will not know how to take care of it; I will therefore wait until my son learns how to write and can understand the value of my property, then I will bequeath it unto him. This is what God said, If I bring Israel into the Land now before they have busied themselves with My Commandments, they will not know the meaning of heave offerings and tithes; no, I had better give them the Torah first and then bring them into the Land. טו ד״א ולא נחם אלהים, משל למלך שהיה לו בן והיה מבקש ליתן לו ירושה ואומר אם נותנה לו אני עכשיו עדיין קטן הוא ואינו יודע לשמרה, אלא עד שילמד בני כתבין ויעמוד על עמקן ואח״כ אני נותנה לו, כך אמר הקדוש ב״ה אם אני מכניס עכשיו ישראל לארץ עדיין לא נתעסקו במצות ואינן יודעין עסקי תרומות ומעשרות, אלא אתן להם את התורה ואח״כ אכניסם לארץ. Many times while studying these Scriptures, it has crossed my mind that if they would have been faithful and trusted the Lord they could have gone right up and into the Promised Land. However, the Lord originally wanted the people at Sinai so He could give them His Torah and they could worship Him before the mountain. The Apostle Paul wrote to the Ephesians saying in Ephesians 2:10 For we are His workmanship, created in Christ Jesus for good works, which God prepared beforehand so that we would walk in them. (NASB) We are His and we are created in Christ for good works which the Lord prepared beforehand so we would walk in good works. It is interesting to consider that the Lord has prepared for the people a way of living and worshiping Him beforehand so that they could walk in His ways which is pleasing to Him. Note also the Scriptures say Yeshua the Messiah was slain from the foundation of the world. This “from the foundation of the world” is a type of being prepared before hand. Note how often this is written in the apostolic Writings (Matthew 13:35, Luke 11:50, John 17:24, Ephesians 1:4, Hebrews 4:3, Hebrews 9:26, 1 Peter 1:20, Revelation 13:8, Revelation 17:8). What we have been discussing thus far from the rabbinic commentary Midrash Rabbah, That God led them not by the way of the land of the Philistines (Shemot / Exodus 13:17), is revealing a very important principle. This is related to seeking the Lord in heaven, seeking His ways, and about taking our faith seriously. For example the Apostle Paul appears to have written to the Corinthians in 1 Corinthians 11:23-32 on this very topic. Paul is speaking about discerning the body and the blood during Pesach and he continues saying that there are those who partake of Pesach unworthily. Notice how taking the bread and the wine in an unworthy manner eats and drinks judgment upon one’s self. Partaking in these things in an unworthy manner results in weakness, sickness, and death. In 1 Corinthians 11:31-32 he says, 11:31 But if we judged ourselves rightly, we would not be judged. 11:32 But when we are judged, we are disciplined by the Lord so that we will not be condemned along with the world. (NASB) Notice that he is drawing into context judging ourselves and the Lord judging us. This is related to taking our faith seriously. Do you take your faith seriously enough to change how you live, what you bring into your body, through the eyes, ears, or mouth? Paul is not talking about the manner in which one takes communion (e.g. Eucharist), he is talking about judging ourselves rightly before God, counting ourselves worthy before God, taking our faith seriously to consider what it is that we are doing when taking the body and the blood in the bread and the wine. Do we take our faith seriously enough that our lives demonstrate that we truly do love God and seek to obey His commands. This is a personal judgment (personal examination) that each of us on an individual basis need to consider before God. I know many people who are sick and ill, I cannot make the judgment call because I do not know one’s heart before God regarding these things, however, is illness related to ones faith? The Apostle Paul seems to suggest that is certainly the case. The point is these words from the Torah regarding the blessing and the curses continue today, they are not done away with in the Messiah Yeshua. Each one of us are held accountable before God in the Messiah, and each one of us needs to consider the consequences of neglecting the Word of God and not taking our faith seriously enough. Being casual about the commandments, is this what Paul was talking about in 1 Corinthians 11 concerning weakness, illness, and death? These Scriptures suggest that the Lord works in our lives in order to turn us from of own sinful ways to God’s ways, and to take our faith seriously. Do you really take your faith and walk before God seriously? Consider your private life, the life you live when you are alone and nobody else sees except God?